While it’s hard to think about detailing your ride in the midst of winter, spring and our renewed love affair with vehicles is just around the corner. Professional car cleaning shops can do a bang-up job on even the grimiest chariot, but you can save yourself some major dollars and achieve similar results with little effort. Besides, there’s something rather therapeutic about getting away from it all and spending a few hours on a bright Saturday morning in your driveway to achieve some worthwhile and tangible results. What you’ll need. 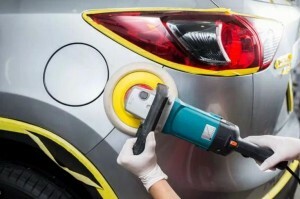 You don’t have to spend a fortune (or even relatively little) to outfit yourself for some car detailing. A five-gallon plastic pail, good wash mitt, chamois cloth, garden hose, kitchen-type nylon scrub brush, shop vacuum, paper towels (or clean microfiber cloth) should cover the hardware needed. For the software, a container of car-wash soap (never use liquid dish detergent), glass cleaner (vinegar and water mix is a cheap alternative), quality liquid wax, carpet-upholstery cleaner and some tire dressing (spray silicone lubricating compound is a better alternative) will create a basic list.